Should the oceans be managed by citizens or financial markets ? I have spent my entire life pushing for new protected areas in the world’s oceans. But a disturbing trend has convinced me that we’re protecting very little of real importance with our current approach. From Hawaii to Brazil to Britain, the establishment of large marine protected areas, thousands of square miles in size, is on the rise. These areas are set aside by governments to protect fisheries and ecosystems; human activities within them generally are managed or restricted. While these vast expanses of open ocean are important, their protection should not come before coastal waters are secured. But in some cases, that’s what is happening. According to the UN's World Database on Protected Areas, which records marine protected areas (MPAs) submitted by countries, more than 15,600 MPAs protect more than 25 million square kilometers (almost 9.7 million square miles) of ocean. In other words, nearly 7 percent of the ocean, an area the size of North America, is under some kind of protection. A more conservative assessment of the global picture, by the Marine Conservation Institute and its Atlas of Marine Protection, shows only 3.66 percent of the ocean managed in true MPAs. Visual aid: it's 2% of the light blue area in this map that the article is talking about. Near-shore waters have a greater diversity of species and face more immediate threats from energy extraction, tourism, development, habitat degradation and overfishing. If we leave these places at risk, we’re not really accomplishing the goal of protecting the seas. We should not continue applauding countries that are simply drawing a line around relatively empty waters where protections are neither essential nor most effective to meet a target. Instead we need to do the harder work of safeguarding the most threatened regions of the ocean — the coastlines — even if they’re smaller. Last year, for example, Chile created a marine protected area that stretched 278,000 square miles around Easter Island. It is impressive in scope, but the protected area still allows fishing in the coastal waters that are the habitat of unique species requiring the most protection. This misguided action was praised as a win for marine conservation. Protecting coastal areas is critical because they are where most of the ocean’s biodiversity occurs. For example, coral reefs — which are a coastal habitat — cover less than one-tenth of one percent of the ocean floor, but are home to 25 percent of all marine species. Mexico, Palau, Britain and, most recently, the Seychelles have also set aside protected areas in their waters but have allowed some fishing to continue as before. And this week, my native Brazil announced that it would establishtwo major protected areas in the Atlantic Ocean. Those areas — totaling almost 350,000 square miles — will encompass islands some 600 miles offshore and increase Brazil’s protected areas to nearly 25 percent of its waters from about 1.5 percent now. The Ministry of the Environment is creating a circle of protection 400 miles in diameter around those islands without actually protecting much of anything. 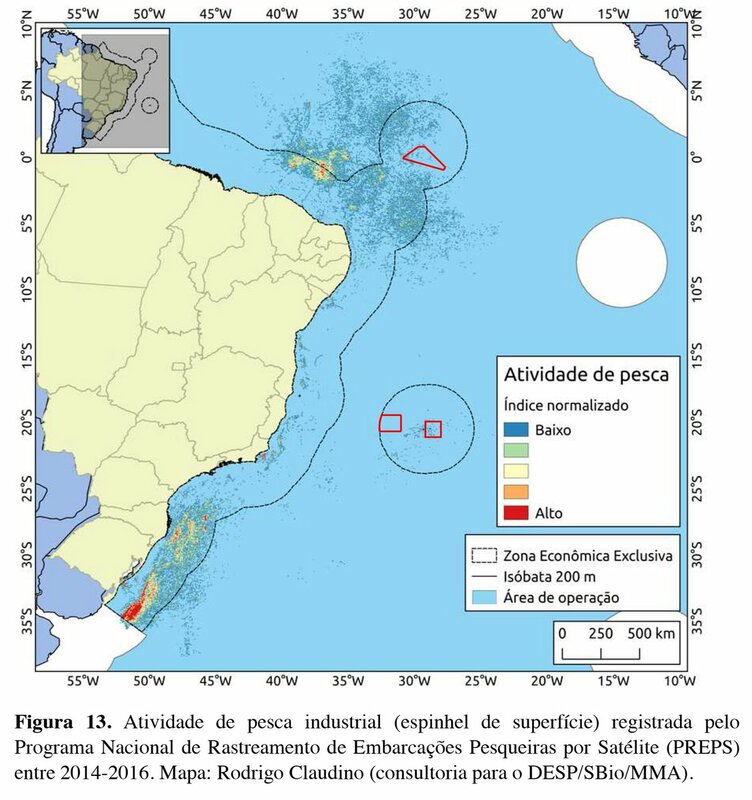 Location of the no-take zones in the new Brazilian MPAs superimposed to the footprint of industrial fisheries. No dots=no fishing; blue dots=low fishing; green=medium low; yellow=medium; orange=medium high; red=high fishing. How these MPAs will protect fish ? The United States has pursued this “just add water” approach, too. In 2006, President George W. Bush created the Papahanaumokuakea Marine National Monument, covering 140,000 square miles around the northwestern Hawaiian Islands. By all measures, this was a great move because it fully protected all coral reefs in the monument. Ten years later, President Barack Obama expanded it into the open ocean, more than quadrupling its size. This action was extolled for providing critical protection for coral reefs, but in reality the reefs had been safe since President Bush designated the original area. Some argue that these open-ocean protected areas harbor hundreds of oceangoing species. While that’s true, even the most effectively enforced of these areas fail to fully protect species like tuna, whose cruising speed of 10 miles an hour means that they can cross a protected area in mere days. The expansion of Papahanaumokuakea, for example, has not affected Hawaii’s annual yield of open-ocean tuna catches. By setting aside large protected areas in parts of the ocean that are not heavily fished, countries have shrugged off their international obligation to pursue science-based conservation and protect places where threatened species spawn or feed. Instead, they have given the public a false sense of accomplishment. The Southern Ocean—the waters surrounding Antarctica—is the one of the last untouched wilderness areas on the planet. But a warming climate and increased fishing pressures put this vast area and its iconic species such as penguins, whales, and seals at risk. The solution: fulfilling the promise by the Commission for the Conservation of Antarctic Marine Living Resources (CCAMLR) to create a network of marine protected areas that will safeguard the world’s final ocean frontier—before it’s too late. First, countries should create protected areas only where they can make a real difference in safeguarding marine life: highly diverse coastal habitats, spawning areas and feeding locales. This year, for example, Honduras announced the creation of a critically important protected area in Tela Bay in the Caribbean. Although it’s very small in comparison to other reserves — only some 300 square miles — it is a huge victory for marine conservation. The government devised a solution that will reduce unsustainable fishing practices while supporting alternative livelihoods in coastal communities. We need more science-based conservation, not convenient conservation. Countries should focus on areas where fish spawn and feed amid threats from energy development, tourism, development, habitat destruction and fishing. Second, we need carefully written rules setting sustainable catch limits and requiring commercial fishing gear that avoids catching unwanted fish and other marine creatures. Setting aside protected areas that amount to nothing but a rounding error in the range size of tunas won’t protect them from overfishing. National Geographic : The World Has Two Years to Meet Marine Protection Goal. Can It Be Done?